This dish has the elements of the classic Chicken Parmesan, but the addition of roasted eggplant and melting Manchego over the top gives it a wonderful deep flavor. When you roast the eggplant ahead, and have it on hand, dinner will come together in minutes. I use the microwave for my steamed spinach – 1 bag of baby spinach, a bit of butter and salt (no water) 3 minutes in a glass container with a lid – perfection. Heat a large saute pan and add the oil and butter. Add the onions and saute until translucent. Add the chicken breasts and brown on one side about 2 minutes. Flip over the chicken and add the tomato sauce and the red wine. Simmer for a minute, then top the chicken with the basil, eggplant then top with the Manchego. Put the saute pan in the pre-heated oven for about 10 minutes until the cheese is melted and the chicken is cooked through. Serve with steamed baby spinach. Dice an eggplant into 1″ cubes. Toss with 2 tablespoons canola oil and 1/2 teaspoon Kosher salt. Roast on a foil lined rimmed cookie sheet for about 45 minutes or until the eggplant is browned. When the eggplant comes out of the oven, fold over the foil to cover the eggplant and let it cool. This will allow the eggplant to soften up the skin and release from the foil. The eggplant will keep in the refrigerator and can be eaten at room temperature in salads or warm in any tomato dish. 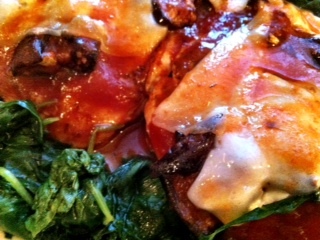 This entry was posted in Recipes and tagged Basil, chicken, Chicken Breasts, Manchego Cheese, Roasted Eggplant, Tomato Sauce. Bookmark the permalink.